Thermodynamic disc traps are valued for their compact size, versatility, and wide pressure range, but have you ever wondered how to improve their overall performance and extend their service life? The TLV PowerDyne® series steam traps are designed to reduce product Life Cycle Cost. This includes reduced costs related to purchasing, installation, maintenance, and steam loss. Disc traps can be susceptible to dirt, environmental conditions and no-load actuation, causing chattering which accelerates wear and shortens service life. Not only do the PowerDyne® disc steam traps include a built-in Y-strainer to filter dirt, but they are also equipped with a mirror-polished lapped disc, which provides tight sealing even under severe superheat conditions. This minimizes chattering and prolongs service life. TLV PowerDyne® disc steam traps have been engineered to save time and minimize maintenance costs. The replaceable module* design enables quick and easy inline repair of normal wear parts without having to replace the entire trap. In order to prevent air binding, some valve discs have a rough-ground surface or machined leakage path. These actions reduce sealing, increase steam loss, and can eventually lead to a costly blowing condition. The TLV PowerDyne® series includes an air jacket for resistance to environmental conditions. The hardened valve trim also helps reduce wear and promotes reliable operation, effectively minimizing steam loss. Disc steam traps are prone to air binding, which prolongs start-up time by preventing the discharge of condensate. In PowerDyne® disc steam traps, initial air is automatically discharged by the thermostatic air venting design*, significantly reducing start-up time. In traps with a single-layer cap, adverse weather conditions and radiant heat loss can result in steam loss from rapid-cycling actuation. The TLV PowerDyne® series steam traps are equipped with an air-insulated jacket, giving resistance to environmental effects and minimizing unnecessary operation and steam loss. 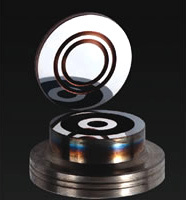 Some valve discs include an air leak pathway or rough finish to prevent air binding. However, this can result in greater surface wear and steam leakage due to no-load actuation. The TLV PowerDyne® series solves this problem: the bimetal air vent ring* eliminates air binding and allows the hardened sealing surfaces to be mirror polished, resulting in a tight seal that saves steam. To reach full operating efficiency, initial air and cold condensate must be purged from steam lines quickly. PowerDyne®'s bimetal air vent ring* quickly and efficiently vents start-up air without binding, eliminating the need for manual blowdown. 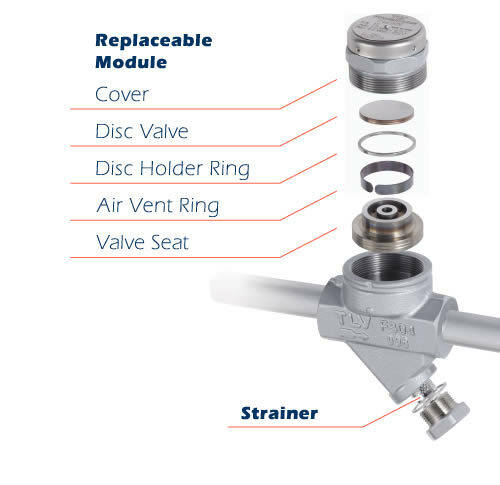 The replaceable module enables quick inline repair of normal wear parts, such as the valve seat and valve disc. TLV PowerDyne® series disc traps include a built-in Y-strainer to filter dirt and scale, which helps protect the internal parts and limits wear.